^ 2.0 2.1 Buchignani, Walter. Amid the tragedy, miracles of survival. The Gazette (Montreal). December 8, 1989: A3. ^ 3.0 3.1 3.2 3.3 3.4 3.5 Chun, Wendy Hui Kyong. Unbearable Witness: towards a Politics of Listening. Journal of Feminist Cultural Studies. 1999, 11 (1): 112–149. ^ 4.0 4.1 Young, Katherine K.; Nathanson, Paul. Legalizing Misandry: From Public Shame to Systematic Discrimination Against Men. Montreal: McGill-Queen's University Press. 2006: 59–61. ISBN 0-7735-2862-8. ^ Conway, John Frederick. The Canadian Family in crisis. James Lorimer and Company. 2003: 163–64. ISBN 978-1-55028-798-1. ^ Eglin & Hester 2003, pp. 54–55. ^ 8.0 8.1 8.2 Conway, John Frederick. The Canadian family in crisis. James Lorimer and Company. 2003: 164. ISBN 978-1-55028-798-1. ^ 9.0 9.1 9.2 9.3 9.4 9.5 Cernea, Adrian. Poly 1989: Témoin de l'horreur. Éditions Lescop. 1999. ISBN 2-9804832-8-1. ^ 10.0 10.1 Valpy, Michael. Litany of social ills created Marc Lepine. Globe and Mail (Canada). December 11, 1989: A8. ^ 11.0 11.1 Wong, Jan. Get under the desk. Globe and Mail (Canada). September 16, 2006. ^ 13.0 13.1 Rakobowchuk, Peter. Lessons learned from 1989 Montreal massacre help save lives at Dawson college. Canadian Press. September 14, 2006 [December 28, 2006]. （原始内容存档于2013年1月15日）. ^ Weston, Greg. Why? We may never know. Toronto Sun. September 14, 2006. ^ Gunman massacres 14 women. Archives. CBC. December 6, 1989 [December 29, 2006]. （原始内容 (video stream)存档于2011-06-04）. ^ Malarek, Victor. More Massacre Details to be Released by Police, but an Inquiry Ruled Out. Globe and Mail. December 12, 1989: A6. ^ Malarek, Victor. Killer's letter blames feminists. Globe and Mail. December 8, 1989: A7. ^ McIntosh, Andrew. Marc Lepine's suicide note to stay sealed; Commission says it can't order police to reveal mass murderer's letter. The Gazette. August 22, 1990: A3. ^ A Difficult Story to Tell. The Story of the Fifth Estate (CBC News). [December 28, 2006]. ^ Fitterman, Lisa. Cops on Lepine's list: Names of six female officers found on Polytechnique killer. The Gazette. March 10, 1999: A3. ^ Pelchat, Martin. Lépine avait des motifs "politiques". La Presse. November 24, 1990: A1 （法语）. ^ 24.0 24.1 24.2 CityNews Rewind: The Montreal Massacre. City News. December 6, 2006 [December 28, 2006]. ^ 26.0 26.1 26.2 Weston, Greg; Aubry, Jack. The making of a massacre: The Marc Lepine story Part I. The Ottawa Citizen. February 7, 1990. ^ 27.0 27.1 CTV.ca News Staff. Mother of Marc Lepine finally breaks her silence. CTV. 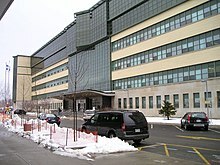 September 18, 2006 [January 1, 2007]. （原始内容存档于2009-04-18）. ^ 28.0 28.1 Malarek, Victor. Killer Fraternized with Men in Army Fatigues. Globe and Mail (Canada). December 9, 1989 [January 2, 2007]. ^ Colpron, Suzanne. Marc Lépine était un premier de classe. La Presse. December 9, 1989. ^ Malarek, Victor. More Massacre Details to be Released by Police, but an Inquiry Ruled Out. Globe and Mail (Canada). December 12, 1989: A14. ^ Canadian Press. Police scour the life of mass killer. Edmonton Journal. January 12, 1990: B9. ^ Poirier, Patricia. Police can't find cause for Lepine's rampage on Montreal campus. Globe and Mail (Canada). March 1, 1990: A17. ^ Canadian Press. Parents fear coverup over murdered 14. Toronto Star. May 30, 1990: A15. ^ Eglin & Hester 2003, pp. 65–88. ^ Fox, James Alan; Levin, Jack. Mass Murder: An Analysis of Extreme Violence. Journal of Applied Psychoanalytic Studies. January 2003, 5 (1): 47–64. doi:10.1023/A:1021051002020. ^ Mancini Billson, Janet. 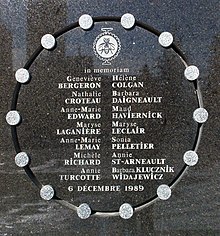 After the Montreal massacre: gender and the pervasiveness of violence. (编) Janet Mancini Billson, Carolyn Fluehr-Lobban. Female well-being: toward a global theory of social change. Zed Books. 2005: 104–05. ISBN 978-1-84277-009-2. ^ Brickman, Julie. Female lives, Feminist deaths. (编) Curry, Renée R.; Allison, Terry L. States of rage: emotional eruption, violence, and social change. New York: New York University Press. 1996. ISBN 0-8147-1530-3. ^ Byard, Roger W. Murder-Suicide. (编) Tsokos, Michael. Forensic Pathology Reviews 3. Humana Press. 2005: 343. ISBN 978-1-58829-416-6. ^ Gerstenfeld, Phyllis B. Hate crimes: causes, controls, and controversies. SAGE. 2004: 48–49. ISBN 978-0-7619-2814-0. ^ Lawrence, Frederick M. Punishing Hate: Bias Crimes Under American Law. Harvard University Press. 2002: 15–17. ISBN 978-0-674-00972-1. ^ Fox, James Alan; Levin, Jack. Extreme killing: Understanding serial and mass murder. Sage Publications. 2005: 227–230. ISBN 0-7619-8857-2. ^ 47.0 47.1 Lortie, Marie-Claude. Poly un an après : Psychose? Blessures au cerveau? Les spécialistes n'ont pas encore résolu l'énigme Marc Lépine. La Presse. December 1, 1990: B7. ^ Young, Katherine K.; Nathanson, Paul. Legalizing misandry: from public shame to systematic discrimination against men. Montreal: McGill-Queen's University Press. 2006: 62. ISBN 0-7735-2862-8. ^ Sheppard, Robert. A sea change in police tactics when it comes to gunmen. CBC News. September 15, 2006 [December 29, 2006]. ^ Boyd, Denny. Couple salvages purpose from their daughter's tragic death. Vancouver Sun. April 20, 1992: B1. ^ Delacourt, Susan. Long-gun registry politics taint service for the victims. Toronto Star. December 5, 2009 [December 6, 2009]. ^ Fedio, Chloe. A mother’s battle to save the long-gun registry. Toronto Star. September 21, 2010 [November 6, 2010]. ^ Peritz, Ingrid. 'A slap in the face' for victims. Globe and Mail (Canada). December 6, 2009 [December 6, 2009]. ^ Campion-Smith, Bruce and Whittington, Les. Long-gun registry survives tight Commons vote. Toronto Star. September 22, 2010 [November 6, 2010]. ^ MacCharles, Tonda. Montreal massacre survivor slams plan to scrap long-gun registry. Toronto Star. November 24, 2011 [5 December 2012]. ^ Long-gun registry end to be celebrated by Tories as fury mounts in Quebec. National Post. April 5, 2012 [5 December 2012]. ^ Montgomery, Sue. Quebec court backs long-gun registry, sets stage for federal legal battle. National Post. April 21, 2012 [5 December 2012]. ^ Vienneau, David. Probe on violence toward women blocked. Toronto Star. January 19, 1991: A4. ^ Hooks, Tess; LeClerc, Patrice; Beaujot, Roderic. Women in Canada: a century of struggle. (编) Janet Mancini Billson, Carolyn Fluehr-Lobban. Female well-being: toward a global theory of social change. Zed Books. 2005: 102–103. ISBN 978-1-84277-009-2. ^ Harder, Sandra. Violence against women: the Canadian Panel's final report. Government of Canada. [February 3, 2007]. ^ Steyn, Mark. A Culture of Passivity. National Review. April 18, 2007 [April 20, 2007]. ^ Kastor, Elizabeth. In Montreal, A Survivor Heals After The Horror; 23-Year-Old Student Tried To Reason With Killer. The Washington Post. December 11, 1989: B1. ^ CBC news. Professor criticizes Montreal massacre memorials. CBC. December 7, 2000 [March 7, 2007]. ^ Kay, Barbara. Lone gunman: The Ecole Polytechnique massacre was a freak tragedy. So why is every man made to feel guilty for it?. National Post (Canada). December 6, 2006 [March 7, 2007]. （原始内容存档于2012年12月6日）. ^ Young, Katherine K.; Nathanson, Paul. Legalizing misandry: from public shame to systematic discrimination against men. Montreal: McGill-Queen's University Press. 2006: 61–62. ISBN 0-7735-2862-8. ^ Conway, John Frederick. The Canadian family in crisis. James Lorimer and Company. 2003: 166. ISBN 978-1-55028-798-1. ^ Helene Meyers. Femicidal fears: narratives of the female gothic experience. Albany, N.Y: State University of New York Press. 2001: 3–4. ISBN 0-7914-5151-8. ^ Mélissa Blais. Marc Lépine: heros ou martyr? Le masculinisme et la tuerie de l'École polytechnique. (编) Blais, Mélissa and Dupuis-Déri, Francis. Le mouvement masculiniste au Québec. Les Éditions du remue-ménage. 2008: 86–92. ISBN 0-670-06969-8. ^ Hanes, Alison. Man threatens to repeat Montreal massacre. Ottawa Citizen. December 2, 2005: A9. ^ Tremblay, Stephane. Anti-feminist blogger calls himself 'masculinist activist'Toronto Sun. Toronto Sun. March 31, 2010. ^ Men wearing white ribbons. CBC. November 27, 1991 [March 7, 2007]. （原始内容存档于2011-06-29）. ^ Young, Katherine K.; Nathanson, Paul. Legalizing misandry: from public shame to systematic discrimination against men. Montreal: McGill-Queen's University Press. 2006: 69–70. ISBN 0-7735-2862-8. ^ Campbell, Charles. Magnets for Memory. The Tyee. November 11, 2004 [December 31, 2006]. ^ Cooper, Rachelle. Book a Monument to Canadian Women Murdered by Men. at Guelph. April 19, 2006 [December 31, 2006]. ^ Ingram, Gordon Brent. Contests over social memory in waterfront Vancouver: Historical editing & obfuscation through public art (PDF). on the w@terfront. February 2, 2000 [December 31, 2006]. ^ Kelley, Brendan. Polytechnique: open to debate. Montreal Gazette. January 1, 2009. （原始内容存档于2009-04-18）. ^ Monique Lépine marks Montreal Massacre anniversary. Canada: CBC. December 2, 2009 [October 22, 2013]. M O'Donovan, Theresa. Rage and Resistance: A Theological Reflection on the Montreal Massacre. Wilfrid Laurier University Press. 2007. ISBN 978-0-88920-522-2.